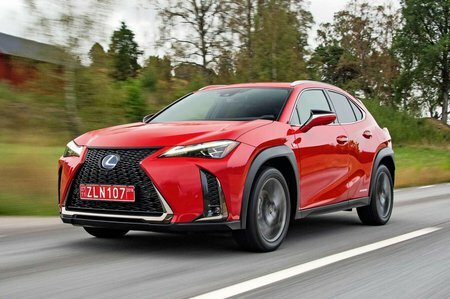 Lexus UX Running Costs, MPG, Economy, Reliability, Safety | What Car? The UX starts at roughly the same price as the BMW X1. It comes with an infotainment system with a 7.0in screen, sat-nav (with European mapping), DAB radio and Bluetooth, as well as LED headlights, a reversing camera and a centre armrest. Lexus predicts that this will be the most popular trim but that most buyers will add the optional Premium Pack, which includes heated seats and front and rear parking sensors. F-Sport adds performance features such as the sports suspension we mentioned earlier, privacy glass, gearshift paddles mounted on the steering wheel, 18in alloy wheels, sports seats and a black grille, bumpers and side sills that are unique to this sporty trim level. Takumi spec is focused on luxury and is equipped with a larger, 10.3in infotainment screen with DVD player, an upgraded sound system, head-up display, leather upholstery and sunroof – but it costs around £10,000 more than the entry-level version. Should you want it, four-wheel drive adds even more to the list price. Every model comes with Lexus’s Safety System Plus package, which includes adaptive cruise control, lane-keeping assistance and road sign detection – a longer list of safety kit than is standard on the X1. It’s too early for any specific reliability data on the UX, but Lexus as a manufacturer finished second in our 2018 What Car? Reliability Survey, which covered 31 manufacturers. That’s rather encouraging for UX buyers, but the brand’s three-year warranty has a slightly mean-spirited 60,000-mile limit. Meanwhile, the UX’s hybrid components and battery are covered for five years, but a 60,000-mile cap still applies. The hybrid UX regains a little ground on its conventionally powered rivals by offering low running costs and company car tax bills. Official WLTP combined fuel economy is a reasonable 53.2mpg, with CO2 emissions of just 94g/km. However, if these points make the UX an appealing option, bear in mind that a plug-in hybrid version of the excellent Volvo XC40 is on the horizon. The hybrid-powered Lexus UX is an interesting alternative to established premium family SUVs, with distinctive looks and a smooth, comfortable driving experience. However, for most drivers, conventionally powered rivals such as the BMW X1 make more sense, both on the road and financially.